Tucked away in one of these floating houses is place I would give a great deal to spend just one week. My friend Alexa is a great traveler and on her way back from doing an internship in Japan she went to Burma. 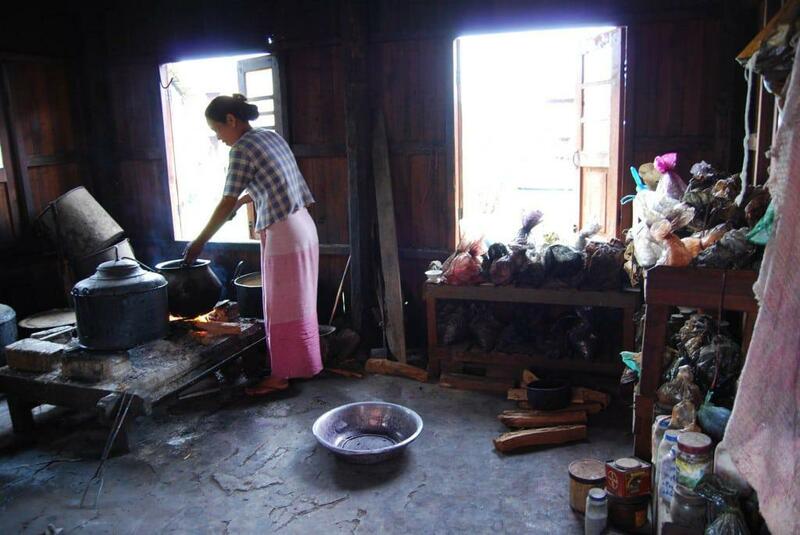 Here she found a weaving and natural dyeing workshop. On the other side of the room from the dyers are spinners and weavers. They spin cotton, silk and lotus. All these natural fibres are locally grown, harvested and hand spun into threads and yarn that are then woven into beautiful cloths for sale (sadly, a very small percentage of the money received goes to the crafters as the country is run by a military junta who take almost all the earnings). The fibre that sparks my curiosity is from the Lotus plant. 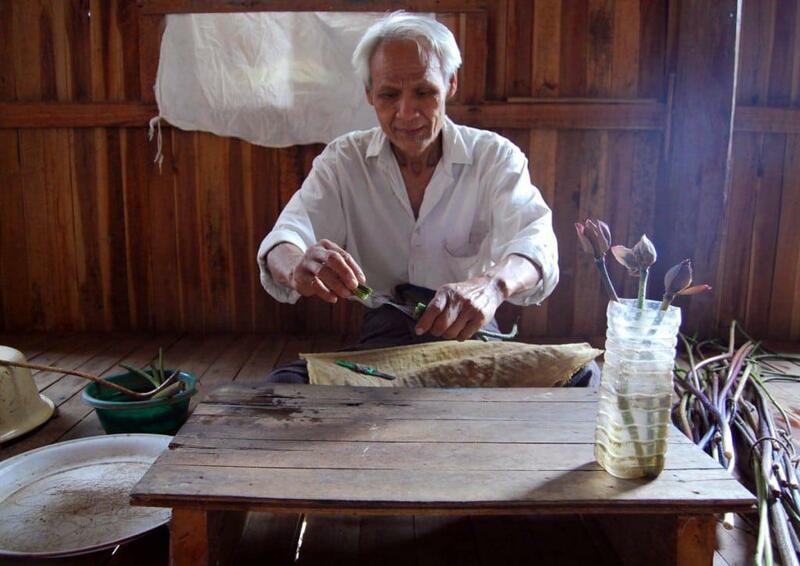 The Lotus stems are collected from the lagoons or flooded fields in the area and then this old man, with a great deal of skill, breaks the stem in two without breaking the sinew-like plant fibres that are inside. Carefully (but quickly) he pulls the two halves apart, stretching and extracting the fibres out of the stems. As he does this he twists them to form a long lotus yarn that is later spun. I think Alexa must have felt me trying to swap places with her when she took these photograph. To imagine the trade secrets and skills that are here leaves me with my mouth wide open and my heart running out the door to get on the next plane to Burma (but I am not quite as brave as my heart always wishes). For Christmas Alexa spoilt me and gave me a naturally dyed silk and lotus scarf – it is as gorgeous as you can imagine. This entry was posted in Blog and tagged burma, lotus plant, lotus thread, natural dyeing, natural fibres, plant fibres, spinning, weaving. Alexa took amazing pictures, thanks for sharing, wanting to go to Burma too. Absolutely fascinating and the pictures are beautiful! 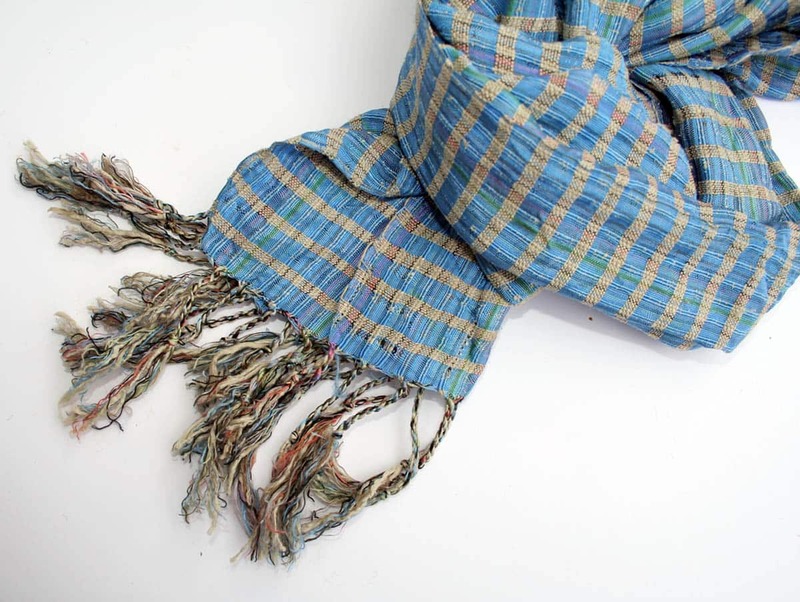 Great post,Wendren and your new scarf looks wonderful! Happy Easter to you and your family!Many greetings to your mom! I was born at Burma (Myanmar). 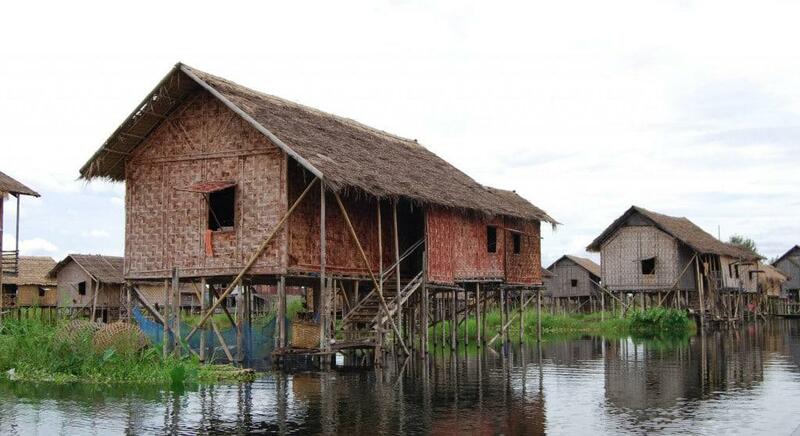 Ahhhh your friend went to the countryside of Myanmar (Burma). I haven’t gone back to Myanmar for ages. I do hope to go back next year and visit my birthplace. Is nice to see pictures…Thanks for sharing.